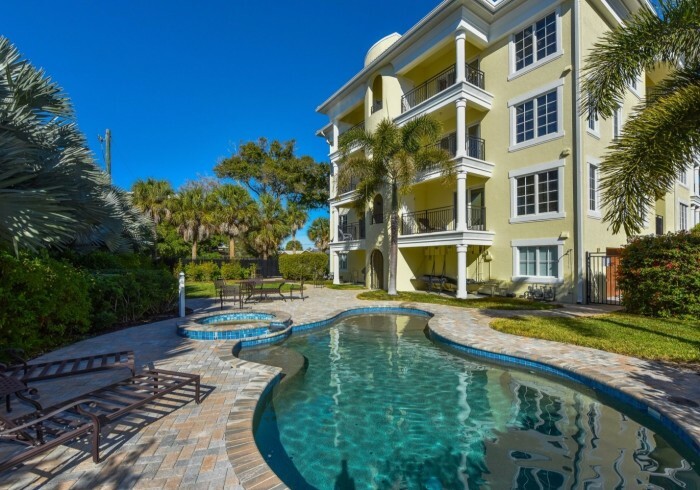 This unit offers free access to Siesta Key Fitness Center. PARADISE FOUND!! Luxury Two Bedroom, Two baths with pool and Spa. Included with your stay: Complimentary Bicycles, Beach chairs, Beach-Towels, Free-rides around Siesta and a 7-day week office for your convenience and guest needs. This masterpiece is the epitome of casual elegance from its bright, well-lit foyer to the sophisticated volume ceilings; Travertine floors throughout. Stylish features include Sub Zero; Wolf and Bosch appliances; sophisticated glass backsplash and beautiful Italian wood cabinetry. Enjoy your morning coffee or candlelight dinners in the fabulous dining area or al fresco on your circular balcony. The master suite is bathed in light; pool views and pool access from its balcony. The Beachy chic 2nd bedroom offers a private balcony. Sophisticated furnishings throughout. 10'ceilings! Private heated pool and spa. The upscale residence is steps away from the world famous Siesta Key white sand beach where you will enjoy breathtaking sunsets. Steps away from fabulous shops and restaurants in Siesta Key Village. Siesta Key Beach is #1 Beach in North America.